This cast aluminum C clamp features a 1-1/2" clamping capacity and an extra deep 6" reach for a wide variety of clamping applications. 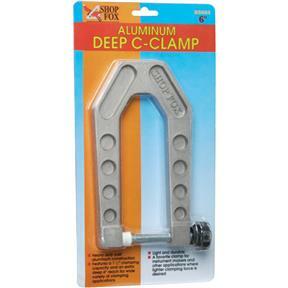 Ribbed construction and thick casting make this C clamp both light and durable. Good quality product, excellent for guitar bridge repair. I bought these clamps to help in gluing up panels when the planks do not align well. They are a much better deal than the $35 clamps I was using. I had to file the bottom edge smooth, which is easy to do in aluminum. The screw clamp side has small foot, so I use a 1/4" plexi plate to spread the force. I like them and plan to buy more. Buy it off a guitar repair website and they sell for twice as much or more. This was my first experience with Grizzly . . . . EXCELLENT one at that . . . . and is sure to be the beginning of a beautiful friendship! Thanks to everyone at Grizzly and Shop Fox (the maker of the clamp). I bought 2 of 3 clamps recently for doing some woodworking where a conventional C clamp was deep enough. The clamps from Grizzly are the best price I found and with quick shipping. I highly recommend doing business with Grizzly Industrial! 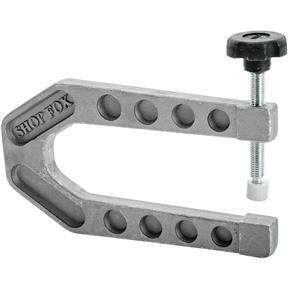 I have a similar clamp made by Ibex and they appear to be the same clamp with a different name for half the price. The same quality clamp as sold elsewhere.....but at a much better price.....I could buy two....and still pay less. Thank you Grizzly! Haven't used it yet, but am anxious....I know its gonna work great when i re-glue the bridge on my acoustic.